Pat and I have been dreaming of taking a California road trip for the last couple years. When we saw a great deal come up for airline tickets to the west coast, we impulsively bought them. We made a plan to rent a car and make several stops along the way, visiting family and friends who now live in California. Over the next couple weeks, I’ll chronicle each adventure from our trip, city by city. Below I started with our first stop– San Francisco! We arrived in San Francisco late afternoon on a Saturday. Anxious to explore our new surroundings, we quickly checked into our hotel, the Sheraton at Fisherman’s Wharf. 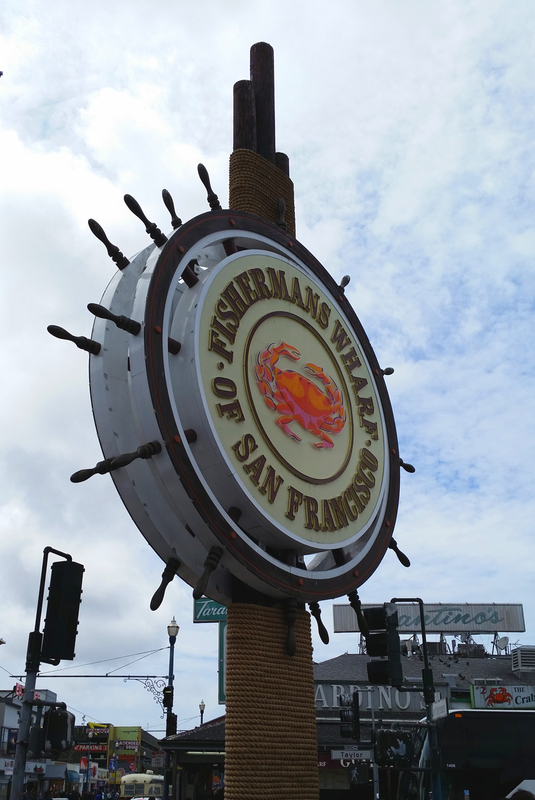 Fisherman’s Wharf appealed to us first because of the price, but there is also a lot to do and see in the area. Even though it’s geared toward tourists (they have a Madame Tussaud’s, and many souvenir shops), I thought it would be a fun place to stay since it was Pat’s first time in Bay Area. Hungry for lunch, we didn’t have to wander too far to find something we didn’t even know we were craving– real San Franciscan sourdough bread! We were drawn to the large windows that gave a peek into the kitchens as the bakers skillfully created animals out of bread. They ranged in size from a massive gator (shown below) to smaller crabs and bears. 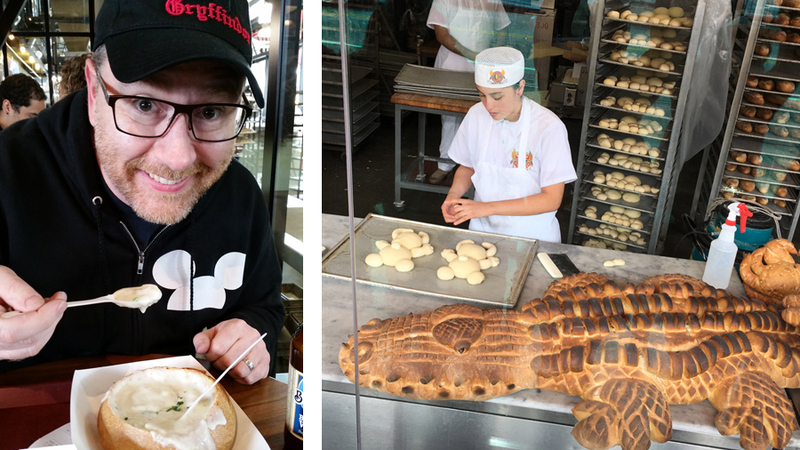 We followed the delicious smell of bread wafting from inside of Boudin’s Bakery and Cafe. 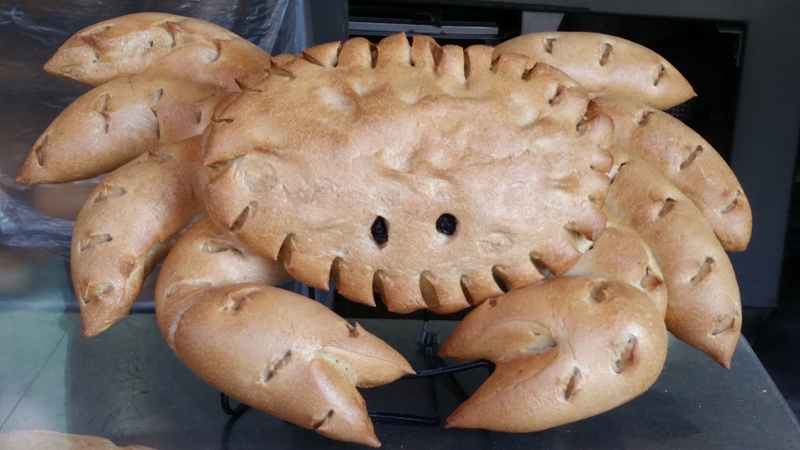 We ordered a crab cake sandwich and clam chowder in a sourdough bowl to share. Pat loved the chowder! We met up with my friend, Claire, who has been living in San Francisco for over five years. We caught up over coffee and a walk through the city, stopping to do some shopping in the Union Square area. 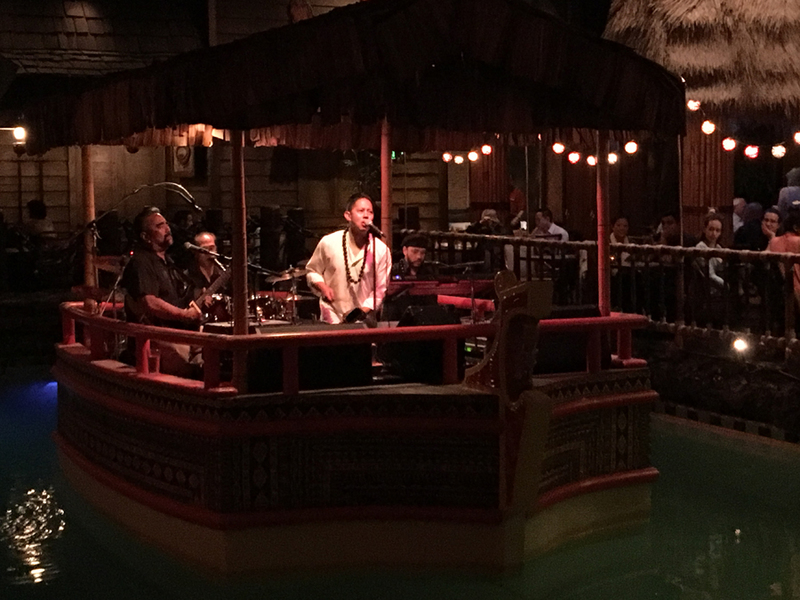 After a few hours the jet lag hit hard, but hearing she was headed to Tonga Room, we knew we had to catch a second wind. This kitschy and cool lounge has been around since 1945 and located inside the fancy Fairmont Hotel. It was definitely worth the trip to see it rain over the band while they belted out Toto’s 80s hit “Africa” on a floating stage in the middle of a giant indoor pool. We didn’t stay long enough to enjoy the flaming fishbowl size island cocktails, but we vowed to return on a future trip to partake in more tiki fun. On the morning of our second day in San Francisco, we met up with Claire for breakfast and started our day of sightseeing. 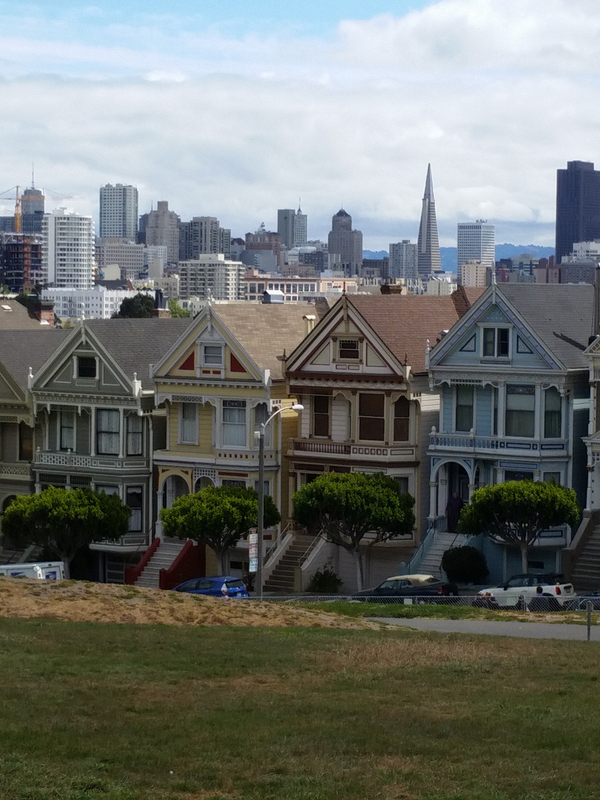 After breakfast we took a short walk to see the “painted ladies.” I knew them from watching many seasons of “Full House.”(Note: These are the houses are shown in the intro to the show, not to be confused with the house used for the exterior shot of the Tanners’ home, a few blocks away). They were so pretty to see up close– they have so many gorgeous details! The painted homes were like jewels, a colorful contrast to the grey skyscrapers in the distance. Alamo Square, which these Victorian homes surround, was under renovation while we were there, and had a big gate around the entirety of the park. The improvement project is supposed to last until early 2017. A bit of a bummer, since it looks like a beautiful park. 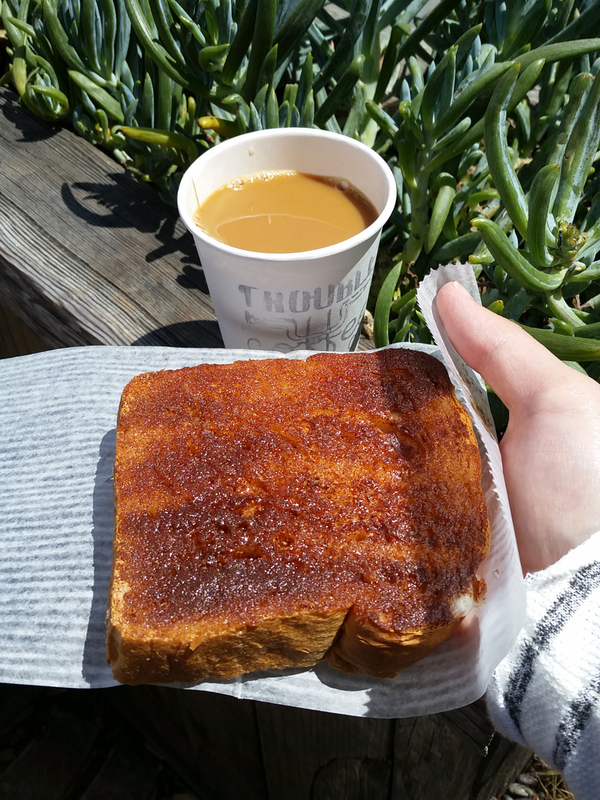 We then made our way toward the North Beach area and tried some fancy $4 San Francisco toast at Trouble Coffee and Coconut Club. 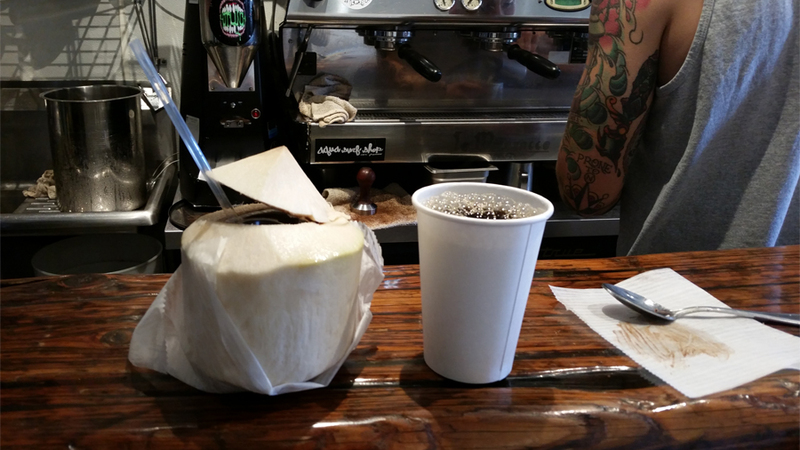 I imagine this is probably one of the few places in the world you can get both cinnamon sugar toast and a fresh coconut at the same place. Yum! We nibbled on our snacks and walked around the cute shops nearby. 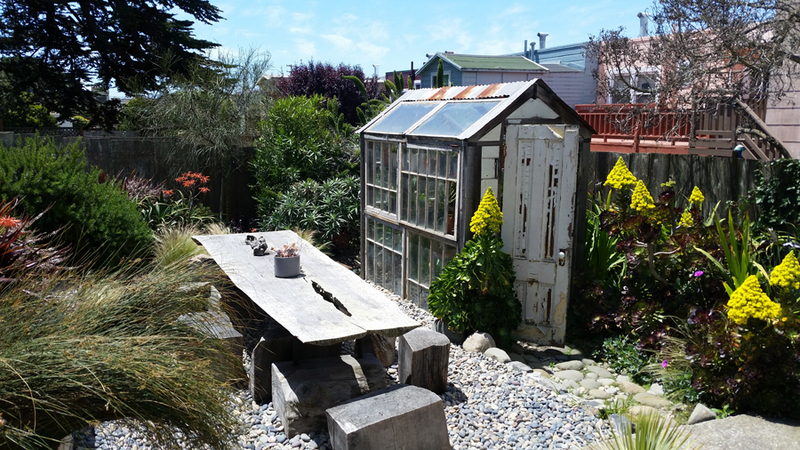 One had an amazing greenhouse in the back courtyard. It made me think I was discovering a secret garden. 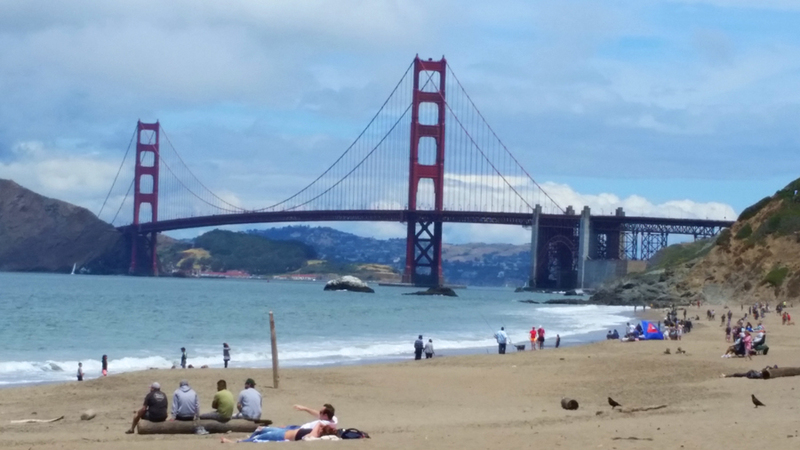 Because one can’t take their first trip to San Francisco without seeing the Golden Gate Bridge, we went to check it out from Baker Beach. It was so relaxing and nice even though it was a bit windy. I never pass up the opportunity to feel sand between my toes. We drove past Golden Gate Park, which we were surprised to learn has an area where bison roam, although we didn’t see them. Something we will have to come back to see! Because we’re pretty big Disney fans, we knew we had to make it to The Walt Disney Family Museum while in town, so that was our next stop. Located in the Presidio, I was expecting a small museum, but it was quite large and took more than a few hours for us to get through both the special exhibit and the permanent collection. 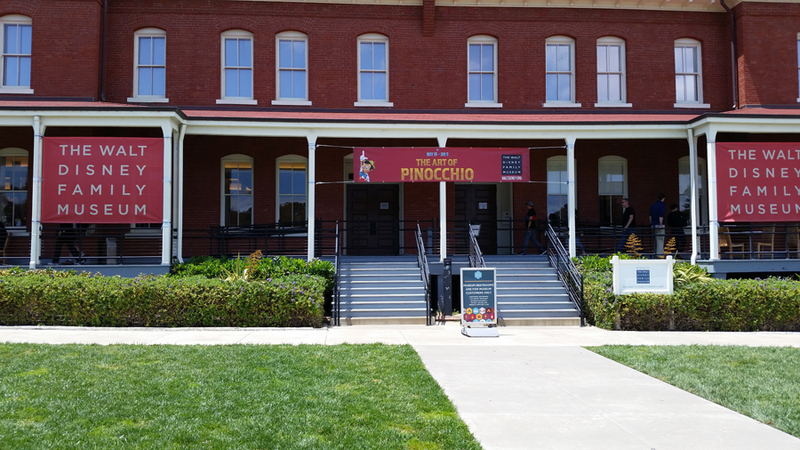 The special exhibit space had “The Art of Pinocchio” on view when we visited. The galleries had production cels, concept art maquettes, and video interviews from animators who worked on the film. I gained a new appreciation for the film: how the story was adopted, the crafting of the characters, and the new animation effects it pioneered. However, my favorite thing about the museum was the permanent collection. 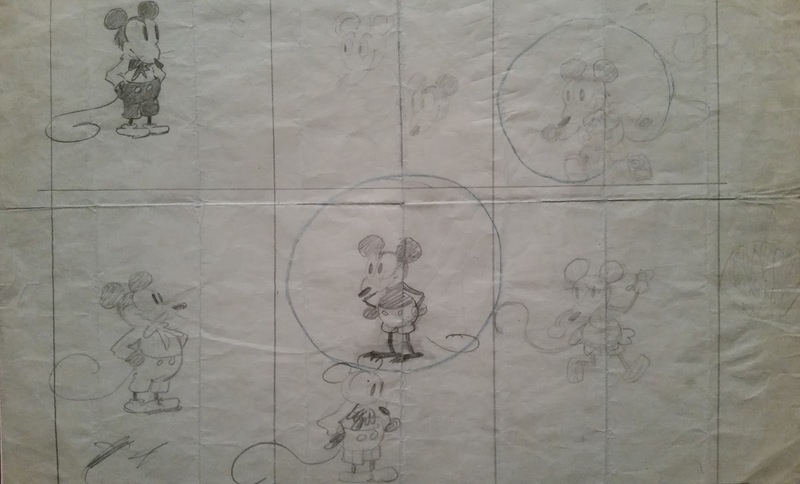 There were 10+ gallery spaces all about Walt Disney, the animation studio, and parks he created. A treasure trove of art and collectibles are on display in the beautifully designed and comprehensive exhibit. 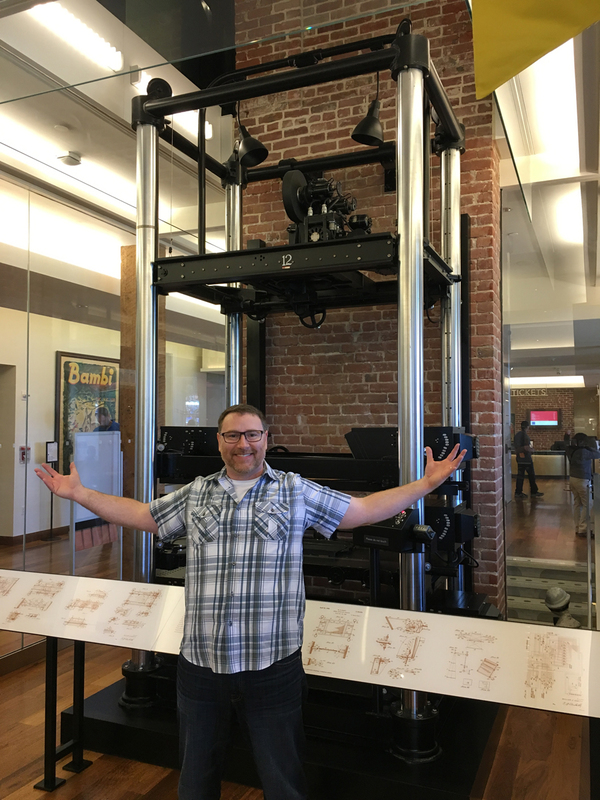 Pat in front of the multi-plane camera Disney used to film animation features. The collection starts with Walt’s early years growing up and moving around the country so his father could find work. Disney starts his career in advertising goes into his study of the animation arts, something pretty new at the time. He did many animated shorts, and not without his fair share of adversity. He kept at it, through some difficult financial times, and through it all a mouse was born. He would go on to create the first animated feature film and develop new technologies in filmmaking. 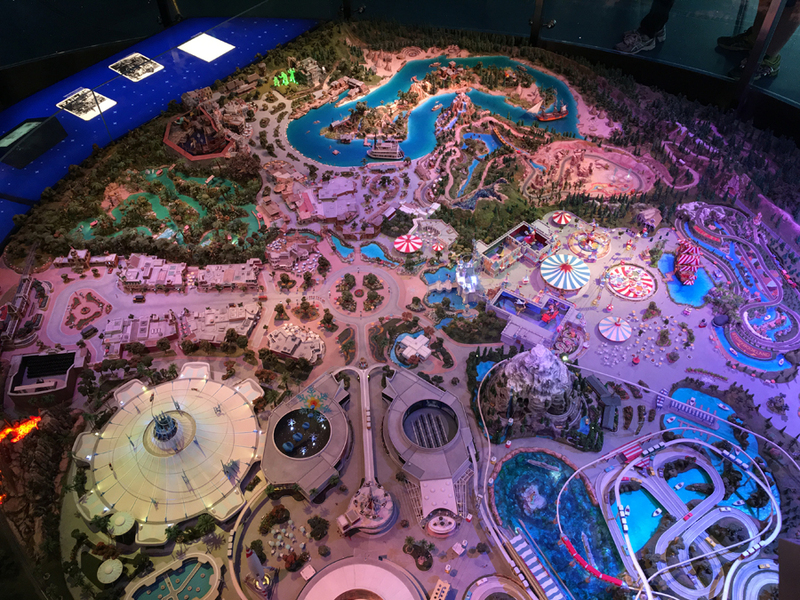 One highlight (of many) was the scale model of Disneyland in one of the last few rooms of the museum. The idea of Disneyland came from Walt’s need to take his children somewhere fun and safe to play that the adults could enjoy too. Originally planned to be built on the eight acres of land next to the Burbank studios, the idea grew. A 100 acre site was found in the city of Anaheim, and orange groves were cleared to make way for a castle, giant spinning tea cups, and flying elephants. The idea of the theme park wasn’t new, but Disney did it best. Pat near Pier 39, with Alcatraz in the far background. 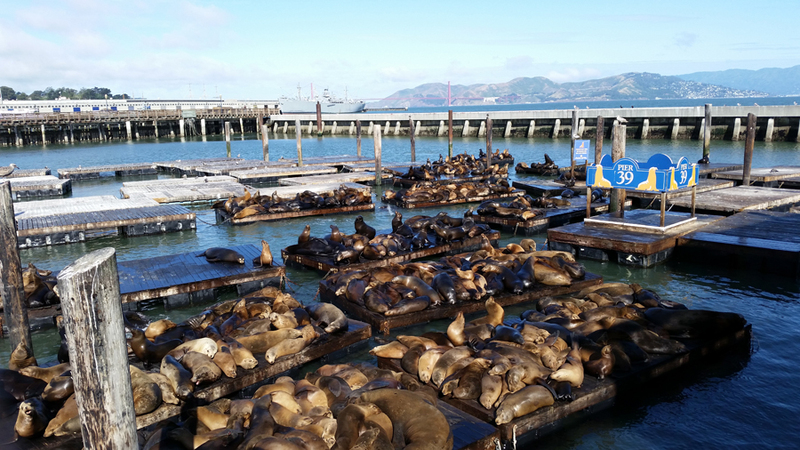 Our hotel wasn’t far from Pier 39 where the seals gather so we saved this for the morning of the last day. There were so many! It was entertaining to watch them play. 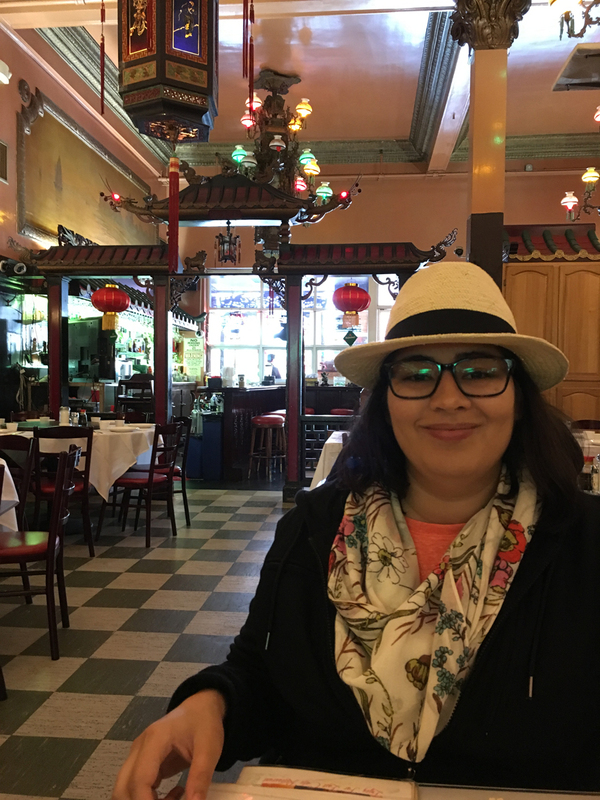 Just before leaving San Francisco we decided to check out Chinatown and grab a bite for lunch. 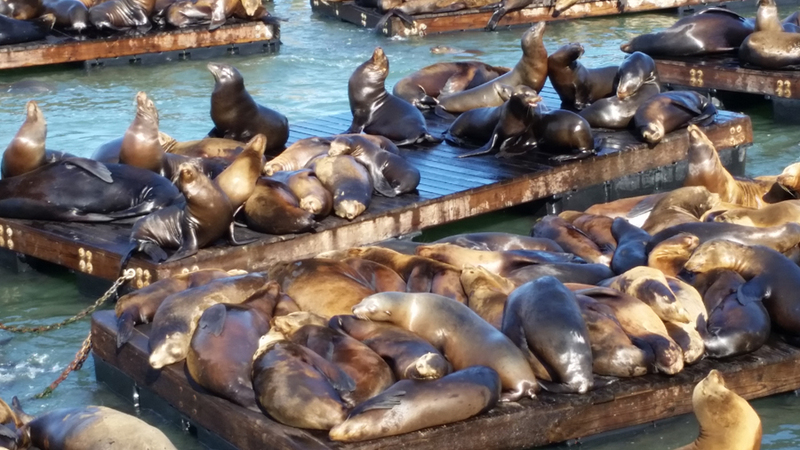 I was surprised at how much I fell in love with San Francisco. It has a relaxed California vibe, and so many unique places to explore (that were only an Uber ride away!). While it’s densely urban, there were beautiful flowers and succulent plants everywhere, adding to the beauty of this eclectic city. Thanks to my friend, Claire for being such an excellent tour guide. Glad we got to visit! Fantastic Blog, Renee! Beautiful pictures.